The retired space shuttle Endeavour rolled into its final home this morning, the California Science Center at Exposition Park. 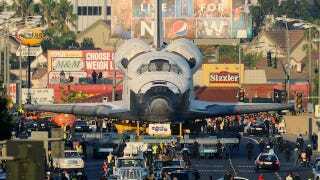 But before being put out to pasture, Endeavour got one final ride this weekend, through the streets of Los Angeles, treating locals to the surreal sight of a space shuttle in their midst. Endeavour goes on permanent display at the California Science Center on October 30th, so even if you missed the parade, you can still visit the ship.